Huge kids waterpark at the Iberostar Playa Mita Resort, Nayarit, Mexico. 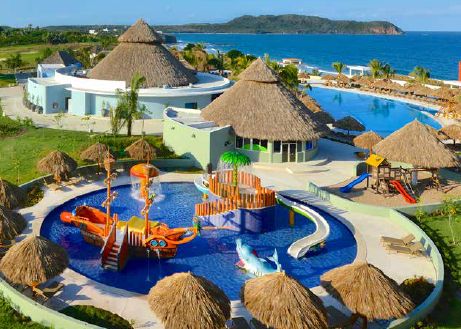 Book a summer vacation at select Iberostar Hotels & Resorts in Mexico and the Caribbean and your kids will stay free! When visiting with two adults paying full price, up to two children can enjoy a free stay between August 16 and November 20, 2015 and again, from November 29 – December 23, 2015. In Mexico, two children 12 and under stay free at these Iberostar Resorts: Playa Mita, Cozumel, Paraiso Beach and Paraiso Del Mar, and one child stays free at the Iberostar Tucan, Quetzal, Cancun, Paraiso Lindo and Paraiso Maya resorts. In the Dominican Republic, two children 12 and under stay free at the Iberostar Punta Cana, Dominicana and Costa Dorado, and one child stays free at the Iberostar Hacienda Dominicus. In Jamaica, two children under 12 stay free at the Iberostar Rose Hall Beach and one child stays free at the Iberostar Rose Hall Suites. Current summer deals valid August 15 to October 31 mean you can take 30% off room rates. With the Kids Stay Free offer, pring deals range from rates of US$85 at the Iberostar Cozumel in Mexico to US$161 at the Paraiso Maya. All rates are in US dollars, per person, per night, based on double occupancy, subject to availability without prior notice. Some additional restrictions may apply, and during blackout dates, regular children’s rates will apply. Iberostar Hotels & Resorts currently manages 19 properties in Mexico and the Caribbean, which include the above family-friendly Premium Gold and Premium category resorts. At Iberostar, families will discover a wide spectrum of exciting and engaging activities to fill up their days. Parents can enjoy a relaxing day at the beach or indulge at the on-site SPA, as young travelers make friends at the specialty Kids Club and the Splash Park or enjoy video games at the Teen Club. There’s never a dull moment. Great news: Iberostar Playa Mita, where the recent TMS Family Travel Summit was held, has summer rates of US$115/night per person and is one of our favorites. It’s located in Riviera Nayarit on Mexico’s beautiful west coast, and is also offering this great savings. Please read Iberostar Playa Mita Resort On Mexico’s Riviera Nayarit for a full review of this great all-inclusive resort for families. Book your reservations through your preferred travel agent, by visiting Iberostar Resorts, or by calling 888/923-2722. Offer can be combined with other promotions— based upon availability and only valid for U.S. residents.